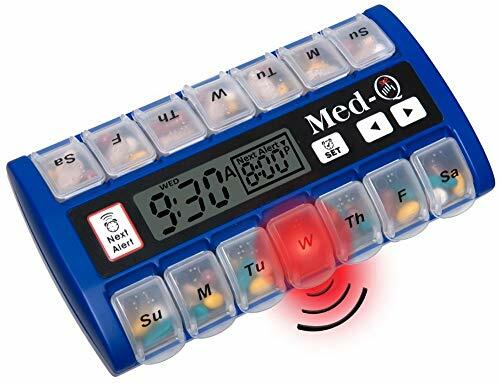 Seven day, battery powered, Med Q portable pill box has 14 dispensing medication compartments, each 1 inch deep x 3/4 inch wide by 1 inch long and removable. Dimensions: H 1 inch X W 4 1/2 inches X L 8 3/4 inches. Blue pill alarm with double beep audible cascading alarm: increases in volume for 5 minutes before it stops. Alarm repeats every 25 minutes until pills are removed or the next alert button activates. Over-sized LED screen with light flashes only in designated pill container. Alarm stops when next alert button is pressed. Individual LED light box flashes for 10 more seconds to make sure the correct pills are taken. Program for day or nigh. Easily read letters plus Braille. Program: once per day for 2 weeks or twice a day for one week. Over-sized finger tip tabs for easy opening. Over-sized buttons for easier programming. Curved internal angling of containers for easy scooping.Capacity of individual box, 11 M and M type candies. Uses two AA batteries. Approximate life is about 1 year. Visual low battery indicator. Weight is 13 ounces, empty. If you have any questions about this product by MED-Q Pillbox Compliance System, contact us by completing and submitting the form below. If you are looking for a specif part number, please include it with your message.